When I get sent a tee it’s usually in a brown padded envelope, or sometimes in those rather dramatic looking eagle emblazoned grey packets from the United States Postal Service, which was why I was rather confused when I found a large box on the kitchen table on Tuesday morning, I thought that Chateau Roux had made some kind of mistake, they don’t sell shoes as well do they? Well, no, they’ve taken a very original approach to the idea of the t-shirt; they’re treating it like a high-class shirt. Click more for the rest of the post. 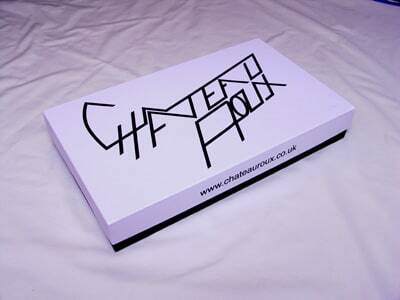 As the pic at the top may well have made patently clear, Chateau Roux pack their t-shirts in a solid branded box, with their logo and website address on it. I’ve never seen such an idea for a tee, for a shirt, yes, but not for a garment that is usually apporached as being the most casual of casualwear. In fact, the branding goes far beyond the box, there’s CR tissue paper, a little CR sticker holding together the wrapping, and a nice big CR sticker that would look mighty fine stuck pretty much anywhere. There was even branded tape on the bag that the box arrived in. Basically, CR have put together one of the most impressive and professional presentations of a product that I’ve ever seen, and I haven’t even started talking about the tee yet! 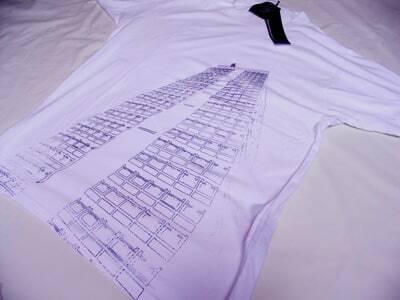 I got their Soho Tower design, as big prints seem to be very popular at the moment amongst the online retail set. Whilst it is big it doesn’t feel too obtrusive, with its relative subtlety probably owing to the outline style of drawing of the tower. You can’t really see it on the picture on the CR site, but the tower has a person holding a childs hand atop it (see the pics), which I can’t really explain, but do quite like. 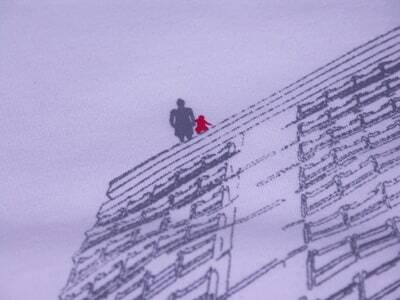 Another very interesting aspect of the tee actually isn’t visible when you’re wearing it. There is a short quote (perhaps a lyric?) 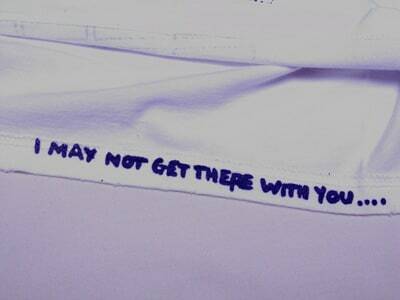 written inside the ribbing at the bottom of the tee, which is a great idea and really adds to the value of the tee, I’d like to see more companies doing random little things like this. I don’t know what stock CR print onto, but it feels very soft and high-quality, though due to their bespoke fit style the shirts do run slim, I’d say about a size less than American Apparel 2001 stock. Every tee is individually printed and treated, so each tee will have a unique level of texture and distress too it, I noticed that the collar on mine had the greatest level of distress to it (little nicks and cuts), but even there it wasn’t that noticeable unless you took a look at it fairly closely. CR use recorded Royal Mail as their delivery method, so it isn’t cheap (Â£3.95), but there are sites out there that would charge that amount for regular post, so it isn’t too bad when you put it in perspective. Oh, and you can have it gift wrapped for another Â£3 (free if you spend more than Â£150), but that might just be excellent presentation overload for me. 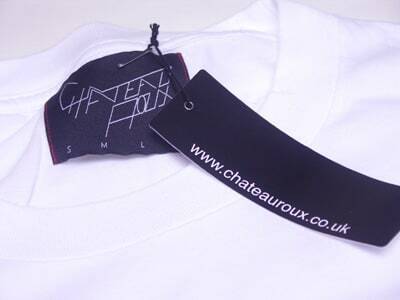 Overall, I am very impressed with Chateau Roux, the whole experience is great, and its great that there are British companies out there that are making products available online that are good enough to persuade people that not all tee’s have to come over from America. Costiness=Â£45 (prices vary, Soho Tower is one of the more expensive items), check out the very flash site at this URL. Great review, great product…gives me some inspiration to spruce up the packaging on my own tshirts…cool! Yowza! I made loads of errors writing that URL down! Great review, Andy. I recieved a different shirt last week, and I am loving it. Check it out here. Cheers! I thought our packaging was special, but you’ve made me realise that it’s our additions that are special, not our packaging. This posting really got me thinking about how to create the wow factor when people receive their springleap Tshirts.